What’s happening with Halifax’s ongoing bicycle lane projects? We know that some are underway, and others are planned to be implemented by 2022, as per HRM’s Integrated Mobility Plan. To keep things straight we’ve created this page to monitor the status of all of the projects the city has promised. Check back for updates. If you would like to help make these projects a reality please sign up to become a volunteer today. The table below summarizes bicycle lane projects in Halifax. Click the project name to see more details. Details of ongoing bicycle lane projects are listed below. In Spring 2018 Halifax Regional Council approved upgrades to the South Park Bike Lane, which includes making the bike lane a parking-protected lane from Sackville Street to Morris Street and extending the painted bike lane south to Inglis Street. The approved upgrades are scheduled to be implemented in spring 2019. To learn more about the project visit HRM’s website. The Hollis Street bicycle lane was approved in 2010 as part of the Downtown Streets One-way Conversion Project. It is the twin to the nearby Lower Water Street bicycle lane. The lane is a buffered lane that includes additional separation from cars and trucks. The lane runs on the left-hand side of the road. Vehicles may stop in the lane to load or unload for up to 15 minutes. The city has marked the lane as “No Stopping” from 7-9am, so no deliveries are allowed during that time. The Halifax Cycling Coalition is working with HRM Active Transportation Planning staff and the Downtown Halifax Business Commission to upgrade the lane to a protected bicycle lane for added protection. 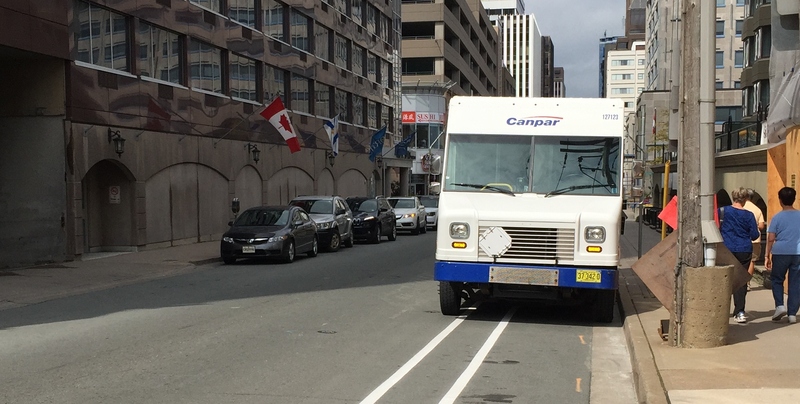 We expect a staff report with a few different options for an upgraded protected bike lane on Hollis Street to go to Halifax Regional Council for approval in Fall 2018. 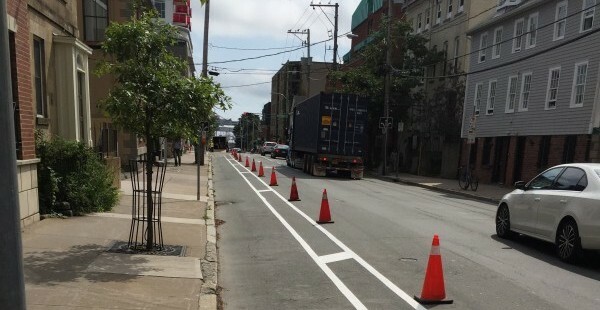 HRM is considering at least two options for the Hollis Street bike lane upgrade, with one option being a bi-directional protected bike lane on Hollis Street and another option being a uni-directional bike lane going southbound on Hollis Street and a uni-directional protected bike lane going northbound on Lower Water Street. 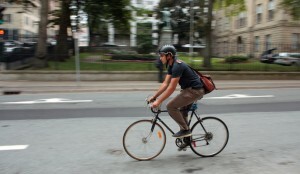 The Halifax Cycling Coalition supports uni-directional bike lanes on both Hollis Street and Lower Water Street, as this will allow for the beautification of both streets and greater access for people riding bikes to the Halifax Waterfront. If you have any suggestions to enhance the bicycle lane please contact us. Changes and enhancements to the Brunswick Street bicycle lane could see it upgraded to a protected bicycle lane, extended south to Spring Garden Road, and connected to the Rainnie Drive bicycle lane. Stay tuned for updates. The University Avenue bicycle lane, phase 1, was built in 2016, which included bollard protected bike lanes going eastbound and westbound on University Avenue between Robie Street and the Dalhousie Quad. In 2017 the bike lane took a step backward, when all of the bollards that provide protection to people riding bikes, were removed in front of the Rebecca Cohen Auditorium. We are pushing the city, the IWK, and the Nova Scotia Health Authority to complete the second half, which all parties committed to in 2012 and reinstall the removed bollards. This project is part of the Urban Halifax Institutional District Bikeway Plan, which involves the city, Dalhousie University, the IWK Hospital, and the Nova Scotia Health Authority partnering to create a network of protected bicycle lanes connecting their buildings along University Avenue and Summer Street. This trail will run from the beginning of the Shearwater Flyer Trail all the way to Shore Drive in Downtown Dartmouth. The missing pieces to this important cycling connection are scheduled to be completed by 2022.